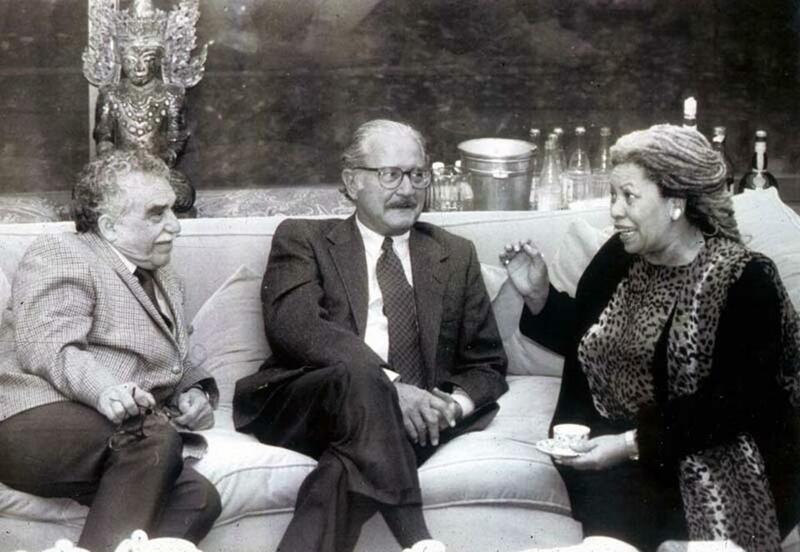 Authors Gabriel García Márquez, Carlos Fuentes, and Toni Morrison meet at a dinner at Fuentes’s home in Mexico city in 1995. The death of Carlos Fuentes last week brought to mind a book and a photograph. The book is his “Myself with Others” and recounts the many borders he crossed — geographical, linguistic, cultural, genre, — and the creative connections he made with other writers, countries, cultures, and imaginations. The photograph, taken at his home in 1995, shows him elegantly dressed and with an expression of intrigue and amazement. He is seated between his best friend Gabriel García Márquez and his new friend Toni Morrison. He looks immensely pleased to be in the company of Morrison, giving her his full attention. I first met him when he came to hear me give a lecture on his book “The Old Gringo” at the Novel of the Americas conference. “We’ve lived parallel lives, David,” he said generously, referring to how his father’s career had taken him across borders and into contact with many cultures. He had been born in Panama and spent some formative years in Washington, D.C., resulting, he wrote, in his becoming “perhaps the first and only Mexican to prefer grits to guacamole.” His adolescence was more global than mine — than most of ours — for he also lived in Chile, Buenos Aires, and Zurich, and these early encounters led to his striving to be a universal writer, a heroic global force. Fuentes was the whole package — that is the real secret of his fame and significance. A great writer of novels, a fine essayist, university professor, dashing diplomat, and critic of governments, he was also the best public speaker of all the Latin American writers. This combination of talents led to him becoming a living symbol and widespread communicator of the literary creativity of Latin America. Indeed, six Latin American writers won Nobel Prizes for literature associated with the Latin American Boom. It can be argued that it was Fuentes’s literary brilliance and personal charisma that helped push back some of the world’s ignorance and sometimes disdain for Latin Americans and their imaginations. He could speak in English and French with the same eloquence and power with which he spoke and wrote Spanish. I remember a lecture that he gave in 1992 at the University of Colorado on the geography of the novel in Latin America. His talk was full of Latin American writers’ names, and he filled the ears of 1,500 people with new accents and the literary lineages of their future. He wasn’t simply dropping names — he had read them and knew most of them personally. We spoke last year just prior to Toni Morrison’s 80th birthday. I had been asked to give one of the tributes for Toni, and I called Carlos to ask if he wished to send a word of greeting in memory of that dinner years ago. “I’ve just turned 81, David, and tell Toni that the 80s are the best decade. After all, we are still alive and loving it.” He preferred to be surprised by death rather than suffer in decline, embracing the pure pleasure of being alive, soaking life in as a participant and not as an observer. Carlos passed away in Mexico City, a city which, he wrote, was built “in the true image of a gigantic heaven.” Because of the way he lived we can believe that his spirit has ample room to roam, always with others.